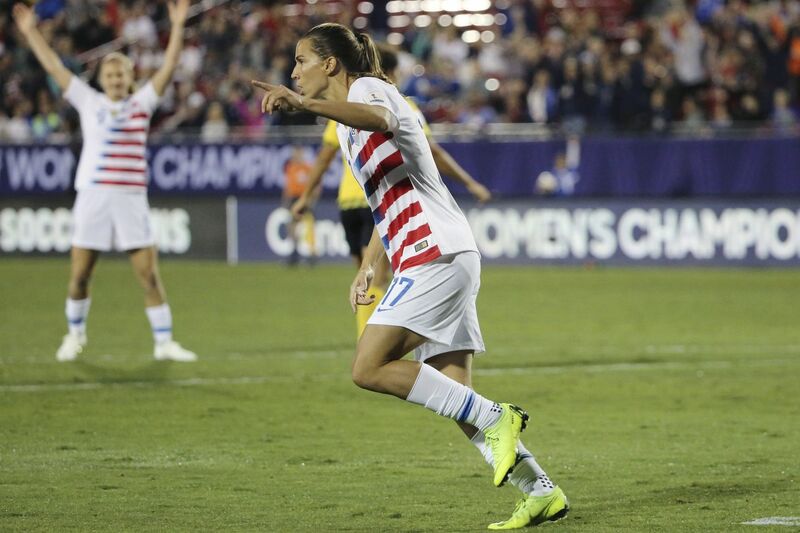 New Jersey native Tobin Heath celebrates scoring one of her two goals that helped the U.S. women’s soccer team qualify for the 2019 FIFA Women’s World Cup in France. When the U.S. women's soccer team started play in CONCACAF's women's World Cup qualifying tournament, the seed of doubt on the landscape was just big enough to be noticeable. Maybe it was planted by some rocky performances since the upset loss to Sweden at the Olympics two years ago. Maybe it was planted by the ghost of the U.S. men's team's still-recent qualifying failure. In Sunday's tournament semifinal, Tobin Heath grabbed that seed and blasted it into the stratosphere. The New Jersey native scored just 100 seconds into the game to kick off a 6-0 rout of Jamaica at Toyota Stadium in Frisco, Texas, that clinched a berth in next year's World Cup in France. Megan Rapinoe, Julie Ertz, and Alex Morgan also scored, and Heath got a second as the United States poured in five goals in the first 33 minutes. Heath's second was the class of the bunch, a first-touch volley of a spectacular service from Portland Thorns teammate Lindsey Horan. Morgan finished the scoring with a penalty kick in the game's final minutes. "Having this feeling and thought in the back of our minds for the last two years [after the 2016 Olympics], it's just great to actually qualify and now talk about the road to France," Morgan said in a TV interview on Fox Sports 1 after the game. "I'm just really happy with how a lot of the younger players, inexperienced in major tournaments, really stepped up and played super-well in this tournament." Jamaica, which had advanced from its group thanks to an upset of 2015 World Cup participant Costa Rica, did its best to keep up. But the Reggae Girlz' squad, built mostly with amateurs and players from U.S. colleges, was simply overmatched. The Americans have now scored 24 goals through four games in the tournament, and have conceded none. "We never took any game for granted," veteran U.S. defender Becky Sauerbrunn said on TV. "We knew going in that Jamaica was going to be a handful and they were. They're strong, they're physical, they got in a few times. But we're happy with the clean sheet, and we're just thrilled to be going to France." Sauerbrunn and her teammates will face longtime rival Canada in Wednesday's tournament final (8 p.m., Fox Sports 1 and Univision Deportes), after Canada booked its trip to France with a 7-0 rout of Panama earlier Sunday. Make 200 caps and you, too, can deliver lines like Diana Matheson on Canada-US rivalry: "You're talking about two teams that want to beat each other and aren't going to give up -- I'm not going to say an inch, I'm going to make it metric and say a centimeter." The final will be for little more than bragging rights, but the third-place game between Jamaica and Panama (5 p.m. Wednesday, Fox Sports 2) will mean a lot. The winner will also go to the World Cup, and it would be either nation's first ever trip. The loser will play Argentina in a home-and-away playoff next month to determine the 24th and final team headed to France. Seventeen teams have qualified for the World Cup so far, including the hosts, England, Italy, Germany, Norway, Scotland, Spain and Sweden from Europe; Brazil and Chile from South America; and Australia, China, South Korea, Thailand, and Japan from Asia. Scotland and Chile will be there for the first time. Switzerland or the reigning European champion Netherlands will take Europe's last spot in a playoff next month. Africa's three teams and Oceania's one will also be determined next month. Once that's all done, FIFA will conduct the World Cup draw on Dec. 8 in Paris. The U.S. will start making plans for the tournament, and they'll be favored to repeat as champion. And U.S. fans who've long dreamed of a summer vacation to France will start making plans to join them.